Bearded dragons are popular pet reptiles for both beginner and experienced reptile enthusiasts. Some people opt to care for one bearded dragon while others decide to have two or more. But regardless of how many bearded dragons you have, if one of them is a female, you may one day suddenly discover eggs in the enclosure. Can a Bearded Dragon Who Lives Alone Lay Eggs? Yes, even a female bearded dragon that lives alone can lay eggs. This may be because it recently spent time with a male bearded dragon or simply because it is not uncommon for female bearded dragons, and other types of animals, to lay infertile eggs without ever having been with a male. Chickens are a prime example of an animal that lays infertile eggs regularly. When a female bearded dragon is getting ready to lay her eggs, she may seem more lethargic than usual and spend more time sleeping or laying under the heat lamp. The bearded dragon's belly will also appear larger than usual since it is filled with eggs. Once the eggs are almost visible from the outside, they will appear like marbles inside your bearded dragon and you will be able to feel them. 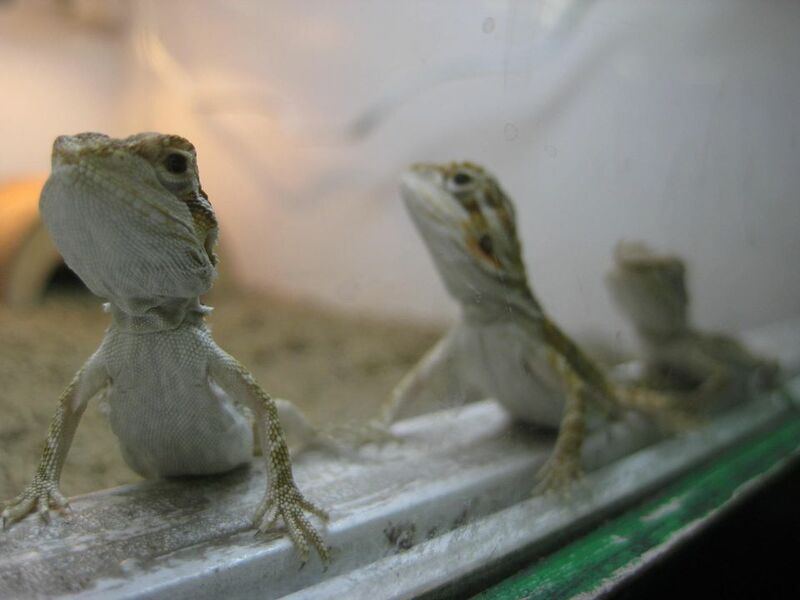 A bearded dragon that has eggs yet to be laid is referred to as being gravid. After about three weeks, a gravid bearded dragon will begin to dig in her enclosure. This is the start of nesting behavior and indicates you'll need to provide your bearded dragon with a proper nesting area. Fill a small container to use as a nest box with clean, moistened bedding that the eggs can be buried in. Many types of reptile dirt or vermiculite bedding options can be used for this. Place this container in your bearded dragon's enclosure under the heat lights for her to dig in. Some people also opt to use completely separate containers, such as a plastic storage bin, for their bearded dragons to lay its eggs in so that they can control the temperature of that enclosure (or place the container in an incubator) more precisely. If you choose to go this route, make sure the bedding is preheated and moistened prior to your bearded dragon laying eggs in it. Bearded dragons typically lay about 20 eggs at a time in groupings called clutches and they typically lay between one and three clutches per mating (but some have laid as many as six). Be prepared to provide your bearded dragon with additional calcium while she's gravid and more food than usual until she lays all the eggs. This is true for all gravid females, whether or not the eggs could be fertile. Bearded dragons that retain eggs for over 45 days may be egg bound. If it has been over a month since you first saw eggs inside your bearded dragon, she hasn't laid any, and she's lethargic and sleeping a lot, you need to get her to a veterinarian as soon as possible. The eggs may need to be removed, sometimes surgically, and your bearded dragon may have low calcium levels that need to be addressed. Egg binding is life-threatening and should not be ignored. Once the eggs are in the moistened, clean bedding, be sure to keep the soil between 80 and 85 F using heat lights or an under tank heater and at 75 percent humidity by misting the soil regularly (but try not to mist the eggs directly as this can encourage mold growth). The eggs will take between 40 and 90 days to hatch if they are fertile. If they are not fertile, they will never hatch and can be disposed of at any point. If you are unsure whether or not they are fertile, you can hold a flashlight up to the egg and look for a pinkish embryo inside. This practice of lighting up the egg temporarily to see if there is something inside it is called candling. Be sure not to handle a fertile egg too much while ​handling it, though, as it could damage the growing dragon inside. Wait at least a few days after an egg is laid before candling or rotating an egg. Otherwise, you may risk detachment of the embryo inside the egg. Caring for fertile eggs can be difficult and tedious. You'll need to monitor the humidity and temperature closely and watch for mold on the eggs. This is why most breeders will use an incubator and uncover the eggs from the soil so they can see them. You won't want to move the eggs around any more than absolutely necessary though, so if you decide to keep them buried, you shouldn't be uncovering them and moving them around daily. If you don't have an incubator, it's best to use a thermometer and hygrometer that sit in the nest with the eggs and wait patiently until hatching time.